A valve is an mechanical device used to control the flow of fluids (both gases and liquids, fluidized solids or slurries). 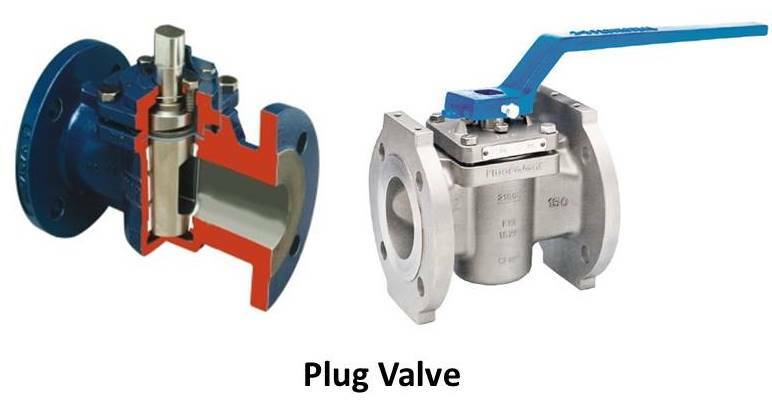 Even though the main purpose of valves is to control the fluid flow, they can be used to regulate the pressure, direction of flow within the piping system. They are used in almost every industries to some extent where we want to transfer any fluid from one place to another. Opening and closing to allow the fluid to start or stop the flow. Throttling the flow of fluid. By opening required valve open percentage throttling of the fluid can be done. Lesser the open % higher is the throttling. Controlling the flow direction of fluid. In multi port valves we can decide the direction (way) of flow. Regulating the required pressure and flow within the piping system. Automatic control valves maintain the flow and pressure by auto adjustment of opening and closing. Relieving the vacuum pressure or relieving pressure from the piping system and equipment. To safeguard the processing system from over pressure and vacuum conditions pressure and vacuum relief valve are used. Isolates or cuts the flow of fluid when required. They are also called as shut off valves. Eg :- Gate valve, Ball valve, Plug valve, Piston valve, Diaphragm valve, Butterfly valve, Pinch valve. Regulates the flow of fluid depending upon the necessity . These valves are also called as control valves. Eg :- Globe valve, Needle valve, Butterfly valve, Diaphragm valve, Plug valve, Pinch valve. NOTE :- Globe valve and Ball valve can be used as both shut off valve and control valve. It is used to prevent the over pressure and vacuum inside the processing system to avoid damage of the piping and equipment. Eg :- Pressure relief valve, Vacuum relief valve. Prevents back flow within the system. It allows only one direction flow of fluid within the system. Eg :- Swing check valve, Lift check valve. Some valves are used to serve for multi purpose applications. NOTE :- Multi port valve means two port valves, three port valves, four port valves. Eg : Gate valve, Globe valve, Lift check valve, In-line check valve, stop check valve, pinch valve, Diaphragm valve, Safety valve, Relief valve, Needle valve. Eg : Swing check valve, Tilting disk check valve, Folding disk check valve, Stop check valve, Ball valve, Butterfly valve, Plug valve. Eg: Ball valve, Butterfly valve, Plug valve. The operating of the valve is done manually with the help of using hand wheel or hand lever or gear wheel or chain. The operating of the valve is done by using electric motor or pneumatic actuator or hydraulic actuator or solenoid. In case of pneumatic actuators the pressure of air acts on the piston or lowers the diaphragm by creating linear force on the valve stem. This kind of operation is mainly done in linear valves and quarter turn valves. For this kind of operation the external power source is not required. The flow of fluid depends upon the fluid pressure to open / close of valve. Eg : check valve, does not allow the back flow of fluid. Depending upon the environmental conditions at the place of installation, different construction materials are used like Cast iron, Bronze, Gun metal, Carbon steel, Stainless steel, Alloy carbon steel, poly propylene (UHMW-PE, UHMW-HDPE, etc) and special alloys. To avoid the contact of process fluid with the body, body can be lined with elastomer. Till now we have discussed about classification of valves. Now we will discussed about some important types of it. Gate valve is a linear motion type valve which can be used to allow or to completely stop the fluid flow. When the disk of the gate valve is completely removed from the flowing fluid the flow is fully opened. When the valve is closed completely disk to seal ring contact surface exists for 3600 and good sealing is obtained. The pressure drop is low. 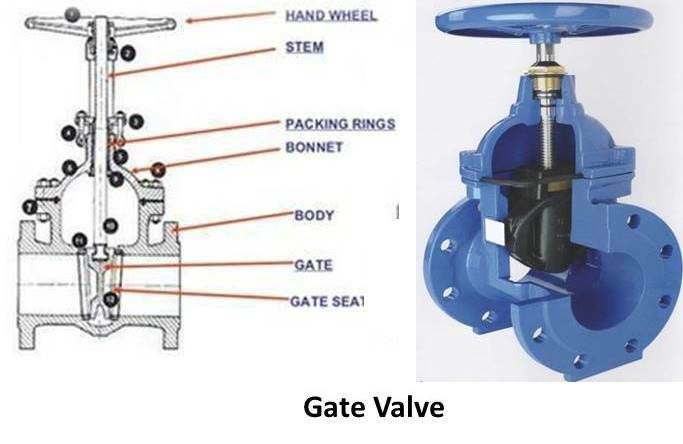 The disk which allows the flow of fluid appears in the form of gate in the system, it is named as gate valve. Globe valve is an linear motion type valve which can be used for opening, closing and throttling of fluid flow. As the disk closes in the same direction of flow, the kinetic energy of the fluid aids closing but impedes opening. Globe valves are named based on the design of spherical shaped body and disk. Many of the globe valves use one of the three types of the disk designs such as ball disk, composition disk and plug disk. Ball valve is an rotational motion and as well as quarter turn type valve. It can be used for complete opening, stop or throttling of fluid. When the valve is opened the ball rotates to a point, where the hole through the ball is in line with the body inlet and outlet. 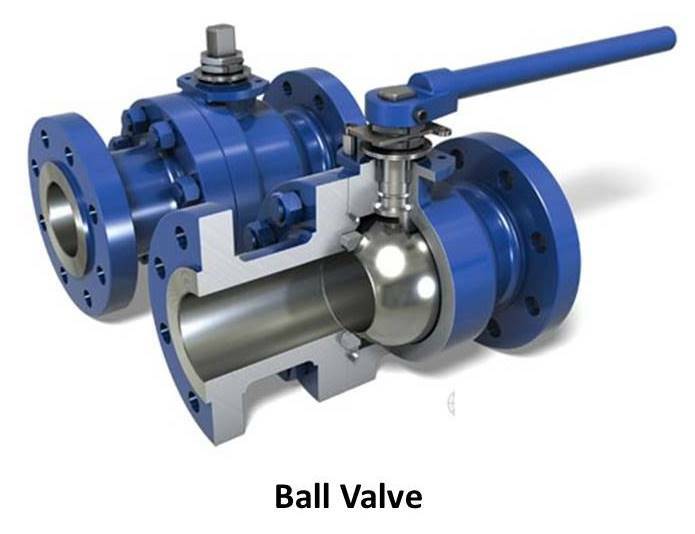 When the valve is closed, ball is rotated so that the hole is perpendicular to the flow openings of the valve body. The valve is named as the shape of the disk in the form of ball or spherical. Plug valve is an rotational type of valve used for start or stop or throttling of fluid flow. Petcock is the simplest form of plug valve. The body of plug valve is machined to obtain tapered or cylindrical form of plug. Plug valves are available in both lubricated and non lubricated design and with different styles of port openings through a single plug or multi port plugs. There are three types of ports in plug valve, they are Rectangular port plug, Round port plug and Diamond port plug. Diamond port plug valve is used for throttling purpose and is venturi restricted flow type. Diaphragm valve is a linear motion valve that can start, stop and regulate the fluid flow. Diaphragm valves are simple pinch clamp valves. Weir – type is used for better throttling, but has a limited range and is used to control small flows. 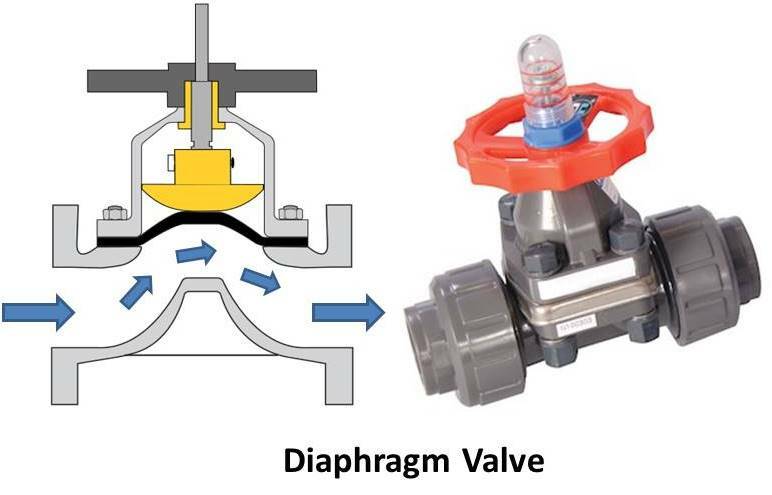 A flexible diaphragm (layer) is placed in between the dam shaped seat and below the stud which connects to the plunger and moved by valve stem, as the use of diaphragm layer in the operation of the valve it is named as Diaphragm valve. Reducing valves automatically reduce the supply pressure to the required or preselected pressure level. Pinch valve is a linear motion type control valve suitable to regulate, start or stop of fluid flow. Uses pinch mechanism and a rubber tube (flexible tube) known as pinch tube to control the fluid flow and a sleeve molded rubber or other synthetic material as the valve body. It is also known as clamp valve. 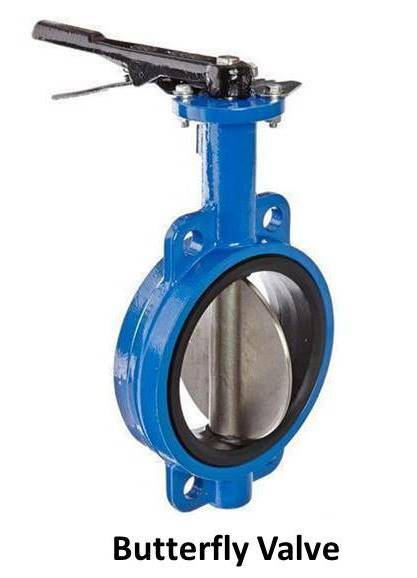 Butterfly valve is an quarter turn rotary motion valve used to regulate, start or stop of fluid flow. Butterfly valves are built on the principle of pipe damper. These valves allow partial opening (based on required output) for fluid flow. The name butterfly was given based on the appearance of the disk which moves around the central axis when the valve is opened. The diameter of the disk is approximately same as the inside diameter of the adjoining pipe. Needle valve is a linear motion control valve which throttles the flow of fluid. This valve can be used for both regulating and start or stopping flow of fluid. Needle valve is another type of globe valve, designed to give fine control flow in small diameter pipes. The valve is named due its sharp pointed conical disk (tapered pin or plunger). Check valves are designed to counter the reverse flow of fluid in the pipe. The pressure of the fluid flowing in the pipe automatically opens the valve, but any reverse flow of fluid will cause closing the valve. 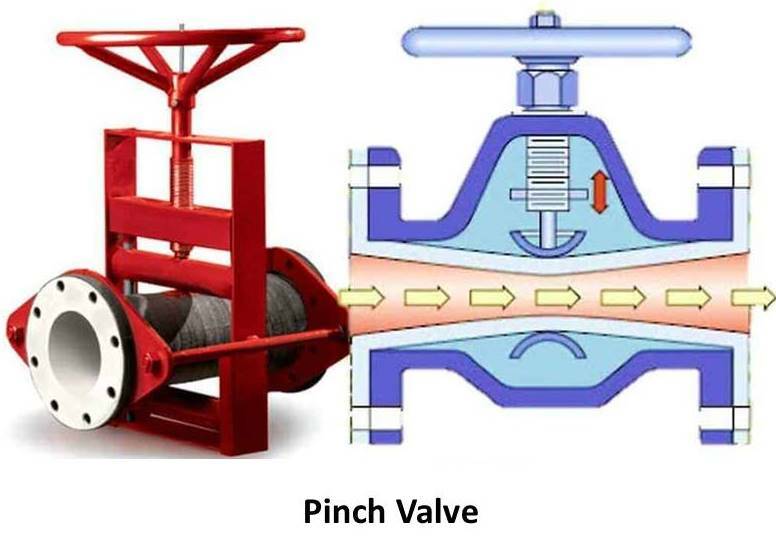 The closing of valve occurs by the weight of check mechanism, back pressure, spring. In these types Tilting disk check valves, Lift check valves, Butterfly check valves and Ball check valves can be installed in both horizontal and vertical piping systems. Relief and safety valves are used to prevent accidental damage and rupture to the equipment by relieving excessive pressure of the fluid system. Both relief and safety valve are similar in operation but are named based on the working. A relief valve is used to relieve the excessive pressure. In safety valve the disk rapidly opens and closes when the system pressure drops below the pressure needed to pop the valve. Where as in relief valve the disk gradually opens and closes when the system pressure drops to set pressure. Starting or stopping equipment without proper valve positioning. Gate valves are used in systems which require low flow resistance for fully opened flow and do not require throttling. Non – rising stem gate valves are used in ships and underground applications where space is restricted. Globe valves are used in the systems where good throttling is required. They are used in high pressure operation of steam. Used where vents and drains require leak tight valves. Ball valve is used where quick turning operation in required. Used as main control valve in household purpose. Plug valves can be used in the applications of high pressure and high temperatures. Diaphragm valves are used in vacuum service. They are suitable for handling of fluids which are free from contamination. Fluids which can clog, corrode, gum up the working parts of valves can pass through diaphragm easily. Butterfly valves are suitable for handling of large flow of fluids at relative low pressures. Used in the situations where the flow should be gradually halted. Check valves are used in the places where the reverse direction of flow is restricted. Safety valve or relief valve are used to release excessive pressure. Gate valves offer less fluid resistance. 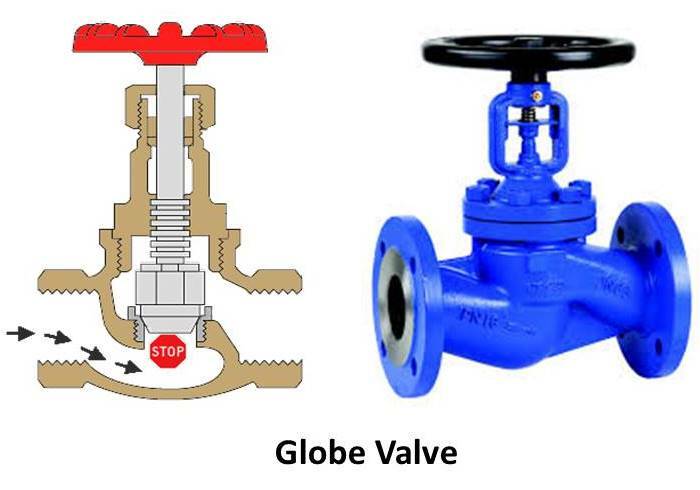 Globe valves can be used for both ways in the circuit. They provide laminar flow, pressure loss is low. Ball valve offers bubble tight seal with low pressure. Plug valve can be used for corrosive, abrasive and toxic fluid. In diaphragm valve Solid materials such as slurries won’t stick or trap. Suitable for viscous fluids. In pinch valves turbulence and friction are minimum. Butter fly valve have good sealing at low pressure. Needle valve give great control over flow rate. In check valves back flow is prevented and certain pressure is maintained. Gate valves are not suitable for throttling applications. Globe valves are not suitable for the medium with particle, viscosity and easy coking. Ball valve is not recommended for continuous throttling. Plug is not suitable for high frequency switching. In Diaphragm valves working temperature and pressures are limited depending upon diaphragm material. Hydrostatic pressure is also limited based on diaphragm. Pinch valves cannot be used for gases and cannot be used in high pressure or temperature applications. In butter fly valves there is a possibility of cavitation and choked flow. 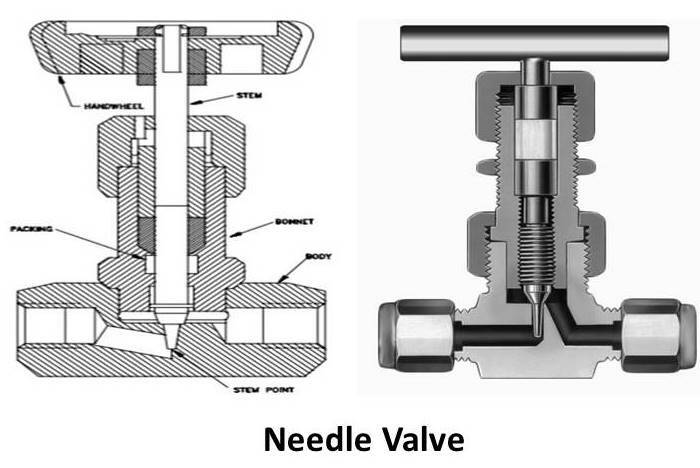 In needle valves position of screw or handle cannot be observed visually. Check valves cannot be used in continuous pulsating systems. All the valves are named based on the design or shape of the disk or based on fluid flowing part. In threaded end connection back welding is not recommended as it damages the seats due to overheating and will cause troubles in the efficient use. Precaution for diaphragm valve: Don’t use excessive force while closing because it may cause plunger to jam the diaphragm against the sealing area which could cut the diaphragm. When the diaphragm is cut valve may leak from valve inlet to valve outlet, leak around stem or leak at body to bonnet joint. These are different types of valves used in piping. If you have any query regarding this article, ask by commenting. If you like this article, don’t forget to share it on social networks. Subscribe our website for more informative articles. Thanks for reading it.